With the five-course dinner, each person gets soup, salad, an appetizer, an entree, a dessert, and a glass of house wine. Promotional value expires 120 days after purchase. Amount paid never expires. Reservation required. Voucher for gift certificates by the expiration date. Tax and gratuity not included. Limit 1 per person, may buy 1 additional as gift(s). Limit 1 per visit. Valid only for option purchased. Merchant is solely responsible to purchasers for the care and quality of the advertised goods and services. 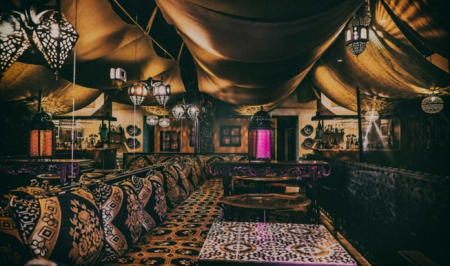 Beneath a ceiling draped with billowing fabric, plush banquettes glimmer with gold thread and colorful beads sparkle on the walls, making Moroccan Tent Restaurant live up to its name. Inside, groups gather around mosaic-tile tables for meals that smell as good as the restaurant looks: chicken kabobs with saffron, couscous fassi with lamb and raisins, and shrimp pastries laced with ginger and coriander.